After each Patriots game, I'll be taking a look at the game film via NFL Game Rewind and posting my observations. Without further ado, here's what caught my eye from Sunday night's stirring win. Friday's news that Rob Gronkowski, Nate Solder and Jonathan Cooper would not be traveling for this one sent a wave of pessimism throughout New England. 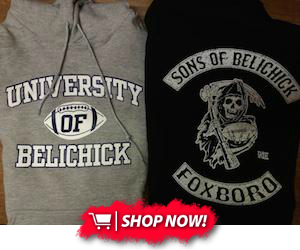 Most Pats fans were already nervous, as the team would have a young quarterback coming off of an up-and-down preseason making his first career start on the road against an excellent defense. Now, Garoppolo would be without the team's best offensive weapon and two presumed starters on the offensive line, including their only true left tackle. With the deck stacked that much against young Jimmy Garoppolo, few expected a win. In fact, the Patriots were 9.5 point underdogs by kickoff, the heaviest line against them since the Cinderella 2001 team took on the vaunted Greatest Show on Turf Rams in Super Bowl XXXVI. Instead of crumbling, the Pats offense put up an admirable performance, doing just enough to escape with the win against a talented Arizona defense. While plenty of post game credit has justifiably gone to Jimmy Garoppolo and Julian Edelman, a closer look at the film reveals a superb game plan that minimized the team's obvious on-paper weaknesses and consistently put Garoppolo in position to succeed. The biggest weakness on the offense going into this game was clearly the offensive line, which has been hit with a rash of early season injuries. 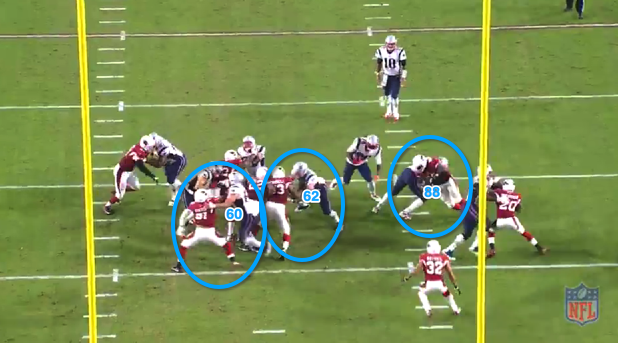 Already without Sebastian Vollmer, the loss of Solder forced the team to dig deep into it's maligned depth at tackle. Rather than flipping Marcus Cannon to the left side, where he struggled through much of 2015, they chose to keep Cannon at his natural right tackle position. I found it interesting that they opted to send Cameron Fleming, a natural right tackle who has struggled in pass protection throughout his two year career, out there at left tackle over LaAdrian Waddle, who worked as the second string left tackle throughout the preseason. I wonder if the team's run heavy game plan factored into that decision, as Fleming has earned a reputation as a powerful run blocker. The depth on the interior of the line has been severely tested as well. Cooper, a presumed starter entering training camp, remains sidelined with plantar fasciitis, Josh Kline was cut, Tre Jackson remains on the PUP list and Shaq Mason is limited a club like cast on his broken hand. That left Ted Karras, a rookie sixth round pick who had some ugly pass protection reps in his preseason tape, to start at right guard, joining fellow rookie Joe Thuney and second year center David Andrews to form an extremely young interior trio. Fans were already expecting a game plan that would protect Garoppolo at least somewhat, but now the play-calling needed to account for a extremely questionable on-paper lineup up front. They did so in multiple ways, with the most obvious being a newfound commitment to the running game. The Pats were hardly consistent on the ground, averaging just 3.4 yards per attempt as a team, but they stuck with the run throughout the night. By the end of the day, their 31 rushing attempts and 33 passes, reflected a commitment to balanced play-calling that was missing last season. Running that often did several things for the offense. 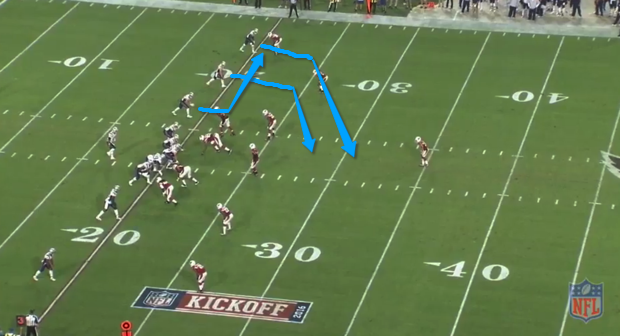 For starters, it limited the opportunities for Arizona's pass rush to make impact plays and disrupt Garoppolo's rhythm. Dropping back to pass 40+ times with Fleming/Cannon as your tackles would have been asking for disaster, particularly against the Cardinals strong edge rushing duo of Chandler Jones and Markus Golden. Instead, they played to the strengths of the personnel they had out there, with Cannon standing out as the primary beneficiary. The Pats often ran to his side and he responded with a strong night of run blocking, often caving in the left side of the Cardinals defensive line with his punishing down blocks. In fact, the Pats poor team rushing statistics didn't really do the offensive line's performance justice. They certainly weren't perfect, as they often struggled to keep Calais Campbell out of the backfield, but there were a number of plays when it was Arizona's active secondary preventing Blount from getting going. Julian Edelman, Chris Hogan and Matthew Slater all showed up on film with missed blocks that led to failed runs, with a few of those plays ruining otherwise good blocking from the big guys up front. One such example showed up with 3:18 remaining in the first quarter. 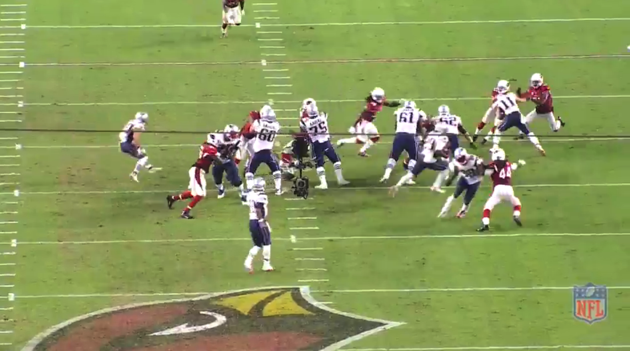 On second and 7, the offensive line blocked down and caved in an Arizona defensive line looking to get upfield. Cannon (61) and Karras (75) did a great job of using their assignment's upfield momentum against him, caving their defenders in. David Andrews also did a fantastic job here, peeling off his combo double team to pick up linebacker Deonne Bucannon at the second level. However, while Martellus Bennett (88) maintained his block on Golden, he was unable to generate movement, forcing Blount to cut around him and into the waiting arms of Tony Jefferson, who shed an attempted block by Edelman. While negative plays were littered throughout the Pats rushing attempts, the commitment to the running game was rewarded with two key plays this game. The first was Blount's third quarter touchdown run, when he dragged a number of Cardinals defenders with him across the goal line. Blount's second effort deserves the praise and highlight reel time it got, but credit Thuney and Andrews for executing the blocks that allowed him to go into contact with momentum. Thuney did a fantastic job of using leverage to angle of the bigger and stronger Campbell from the gap, while Andrews eliminated linebacker Kevin Minter at the second level. Cameron Fleming also deserves credit for occupying the speedy Bucannon at the second level. 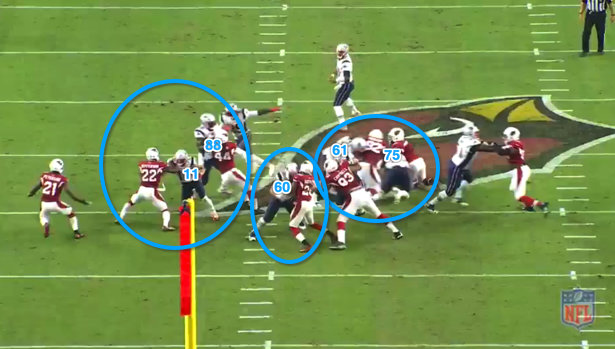 Bennett came across the formation on a "wham" block to seal the edge against Chandler Jones and while he didn't fully land the block, he occupied Jones just enough to turn what could have been a tackle for loss into a whiff, with Blount charging full speed ahead through the gap. The result was a key touchdown that opened up a 17-7 lead. The other key play was Blount's key third down conversion on the team's final drive. Facing a third and 11, handing the ball off seemed to be a concession that the team was merely looking to gain a few extra yards before attempting a field goal. Instead, great all-around execution allowed the drive to continue. The key block on this play was a double team by Karras and Cannon on Calais Campbell, which moved the Cardinals massive lineman out of the point of attack. Cannon then peeled off the double at the exact right time, picking up Bucannon at the second level. Joe Thuney pulled from the backside and lead the way for Blount, picking up an unidentified defensive back as Blount powered through the gap that had been occupied by Campbell. Credit on the play also goes to Bennett, who sealed the edge against Golden, Edelman for a successful stalk block up the field, and Blount, whose cutback forced Patrick Peterson to miss an open field tackle, allowing him to gain first down yardage. This was phenomenal all around execution from the offense on one of the key plays of the game. Speaking of Bennett, his usage was indicative of the ways the coaching staff schemed to protect the offensive line. A run heavy game plan was always going to utilize Bennett, who came to New England with a reputation as a strong in-line blocker, and Bennett showed up as advertised with plenty of strong edge-setting blocks. However, while many (myself included) expected Bennett to step up as one of Garoppolo's top targets in Gronkowski's absence, his pass catching impact was limited to just 3 catches for 14 yards, as he was often utilized as blocker on passing downs. The second half saw both Bennett and James White often utilized to "chip" one of the Cardinals edge rushers, disrupting their timing and giving the Pats slow-footed tackles a chance to recover against Golden and Jones' explosive get off. While Golden and Jones each had sacks, their impact on the game was limited to a handful of plays. Neither edge rusher made a play of note when Bennett or White hit them at the line before releasing into their pattern. Bennett also stayed in as essentially an extra offensive tackle on a few snaps, holding his own each time. In fact, one such snap was Bennett's controversial holding penalty against Jones, which looked just as dubious on the second and third replay than it did live. That snap was a good example of the physicality Bennett brought all night, as he executed a thankless (at least statistically) role with aplomb. When the offense did throw the ball, they emphasized getting the ball out of Garoppolo's hand quickly, minimizing the amount of time the line had to hold up in pass protection. 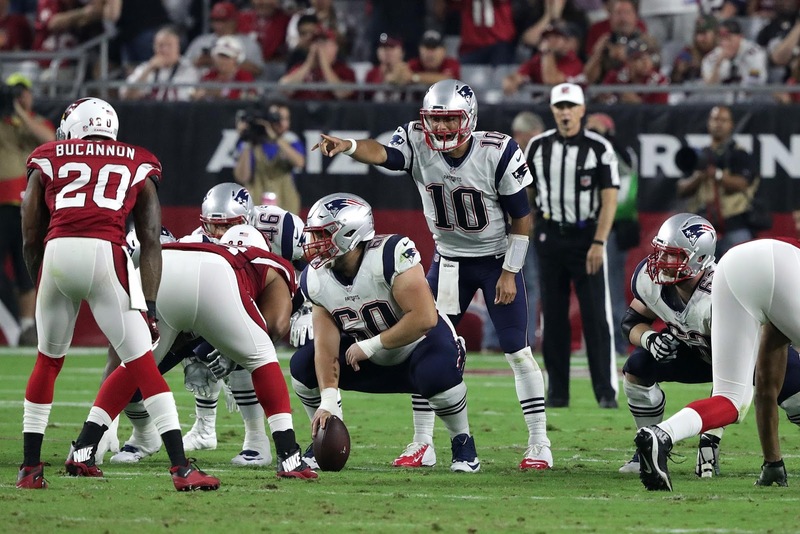 Garoppolo rarely held the ball longer than 2 seconds, as a number of his completions came on screens, quick outs and other passes designed to simplify his reads and get the ball quickly to his playmakers. While Garoppolo was hit a couple of times, including those aforementioned sacks, the majority of his drop backs were clean, allowing him to get into a rhythm early that never left him. According to ProFootballFocus, Garoppolo had a clean pocket on 26 of his 33 passing attempts, going 20-26 for 216 yards and a touchdown on those snaps. The likes of Fleming, Karras and Cannon deserve plenty of credit for outplaying expectations, but so does Josh McDaniels for minimizing the opportunities for Arizona to exploit them in pass protection. As for Garoppolo himself, he calmly took what the defense gave him all night. After overthrowing an open Chris Hogan on his first attempt, Garoppolo shook off the jitters and was decisive and accurate all night, feasting on a number of quick outs, slants and other short passes that led to a high completion percentage (72%) and helped to avoid third and long situations. One such example came on this second quarter third down conversion. Here we see the play design, as outside receiver Malcolm Mitchell and slot man Edelman both run in breaking routes designed to draw coverage to the middle of the field. 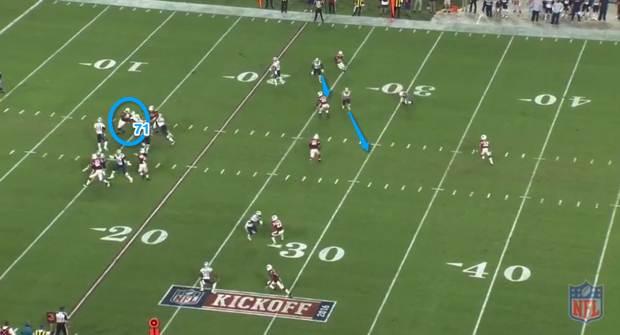 The play is designed for Hogan, who runs a quick out into the flat, taking advantage of the space Mitchell and Edelman's routes have created. This bird's eye view (unintentional pun alert!) shows how the play's design creates such an easy completion and conversion for Garoppolo and the offense. As you can see, Garoppolo has diagnosed the defense prior to the snap and makes a quick decision; the ball is already out. In fact, the play also demonstrates how the play-calling helped the offensive line, as Fleming being beat around the edge is a moot point due to the quickness with which Garoppolo has gotten rid of it. Mitchell sells his slant route particularly well, turning it into a legal pick against a defense that is now scrambling. Hogan is wide open, makes the easy grab, and has enough space to gobble up 19 yards before Tyrann Mathieu can knock him out of bounds. Confidence building plays like this helped build Garoppolo up, as he played with poise in key situations. It's easy enough to rack up short, open completions, but situations like the third and 15 Garoppolo converted to Danny Amendola will rattle lesser quarterbacks. While Garoppolo did benefit at times from the play-calling, which at times went conservative rather than putting the game entirely on his shoulders, his 8-10 performance on third down showed that he could execute when the training wheels came off. In fact, it looks like the conservative game plan was in place more to protect the offensive line than Garoppolo, who often improvised to extend the play and give his playmakers a chance even when the quick, easy reads weren't there. All in all, it's hard to not be excited by this performance. While far from perfect, Sunday's offensive output proved more than the fact that Garoppolo clearly belongs at the NFL level. It served as the latest reminder of how the coaching staff consistently puts it's personnel in the best position to succeed, regardless of how injuries, suspension or any other external factor affects the team. That, more than anything, has always been the extra advantage the Pats have had over the rest of the league during the Belichick era. I repeatedly reminded myself once the Gronk/Solder news hit of the high number of times the Patriots had gone into a game at a considerable on-paper disadvantage, only to somehow come away with the win against all odds. "Of course", I had to remind myself every time, "all of those wins came with 12 under center". While 10 is no 12, he proved that he could be more than good enough, especially with the best coaching staff in football consistently keeping him in the right situations. By the time Chandler Catanzaro had hooked his game winning field goal attempt wide left, I had no choice but to channel my inner David Byrne, slapping myself in the face for my lack of faith. "Same as it ever was", indeed.